Jean Witt received the 2015 Bennett C. Jones Award for Outstanding Median Hybridizing this year, in recognition of her long years and many contributions to median iris hybridizing. 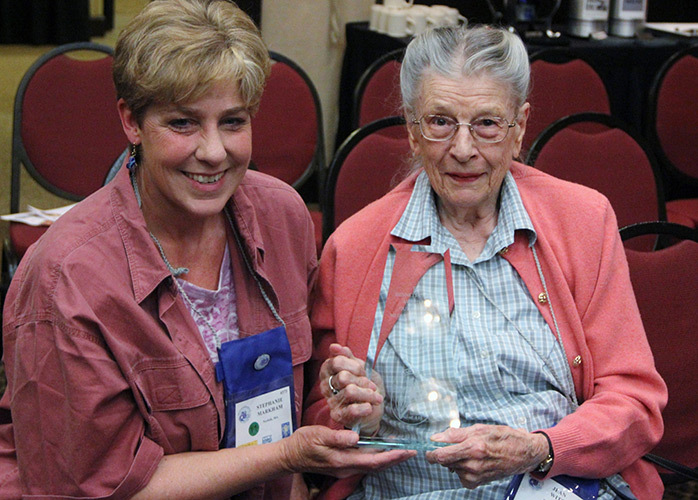 The award was presented to Jean at the Median Iris Society Board meeting by Stephanie Markham, Honorary Awards Chair. Jean Witt has been involved in the growing, breeding and promotion of irises for more than 7 decades. Her botany degree and genetics training sparked an interest in hybridizing in the 40s, with the irises she had purchased during WWII providing interesting subjects for experiments. In the 50s, when Alice White (the White of the Williamson-White Award/Medal) was looking for people interested in breeding MTBs (or Table Irises, as they were more commonly called then) Jean was among the first to join her round robin. She and other robin members spent a great deal of time and energy tracking down and evaluating old varieties and figuring out how to breed new ones in the petite configurations they wanted, leading to the establishment of MTBs as a separate class and the definition of the MTB standards. While most of her median hybridizing has been in MTBs, Jean has been and still is deeply involved in the collection, preservation, distribution and utilization of iris species, many of which have been critical to the development of median cultivars. Jean joined the Median Iris Society soon after it was founded and has contributed greatly over the years, applying and sharing her well-deep knowledge of botany, genetics, and iris species with everyone, both in print and in personal correspondence. In the 1960s and 70s, when it was difficult to market non-TB irises, Jean joined forces with other breeders to put out a price list of dwarf and median irises. She obtained a nursery license and continued to market MTBs and species until her husband’s death in 1984. She has written numerous articles for The Medianite (for which she served as guest editor), the AIS Bulletin, and several section publications (SIGNA, HIPS, SPCNI and others) as well as for books such as The World of Irises (for which she provided both pictures and text) and Currier McEwen’s The Siberian Iris (for which she provided watercolors and line drawings). She has given innumerable talks on irises to local garden clubs, plant societies and elsewhere, is an AIS judge, and has mentored numerous iris hybridizers and enthusiasts, donating freely of her time, talent, knowledge, experience and irises. She received the AIS Distinguished Service Medal in 1983 and the AIS Hybridizer Award in 2012. Jean has registered 32 MTBs and 2 BBs, as well as 2 PCNs, 5 siberians, 5 species irises and 14 species hybrids. She has also introduced 5 MTBs on behalf of 4 other people. Her first MTB, registered in 1962 and introduced in 1966, was the white and pale blue amoena ‘Ice Fairy’ (‘Pewee’ X ‘Mrs. Andrist’), which won an HM in 1968, a Judge’s Choice (a popularity vote of recent introductions that became an informal recommendation of quality) in 1969, and the Williamson-White Award in 1973. Her bright yellow MTB, ‘Spanish Coins’ (1976), won an HM in 1977 and the Williamson-White Award in 1981. Both of these irises are still widely grown and used in MTB breeding today, as are several of her other MTB introductions, many of which have either bearded species or antique TBs (or both) in their pedigrees, such as ‘Dappled Pony’ (1981, HM 1984), a dotted-all-over violet-on-white plicata, and, more recently, the AM-winning ‘Redrock Princess’ (2006, HM 2008, AM 2010), a ruffled brown and rose-red bicolor — the pedigrees of both of these include the small diploid species I. reginae as well as the antique diploid yellow TB ‘Pluie d’Or’ (Cayeux 1928). Jean continues to hybridize even into her ninth decade. Her most recent MTB introduction is ‘Little White Tiger’, a petite white-and-violet-striped amoena, which was introduced in 2013 by Aitken’s Salmon Creek Garden. And some of her most recent MTB seedlings were on display in the convention gardens, including one really unique thing out of ‘Pluie d’Or’ (seedling # 10-13-2N) — a variegata-plicata with pale yellow standards and the lightest sanding of red-violet dotting in the center of the falls – and another really interesting variegata MTB seedling (14-11-3C) with ‘Rhages’ (Meade-Riedel 1934) in the parentage that just glows when the sun hits it, to appear nearly orange. In sum, Jean has been a true median iris pioneer over the course of more than 7 decades, and continues to experiment with her iris hybridizing, explore iris species and actively participate in the discussion about irises to this day. Thank you, Jean, for all of your contributions to median irises!